This is a 90-minute program that actively gets students to explore the museum’s retired fishing trawler, Cape Sable. Students will investigate the vessel, analyze their observations and draw conclusions as to what life could be like aboard a fishing trawler. The program connects with the school curriculum in an engaging format. Students will be given the opportunity to explore how the workings of a trawler can impact the marine environment and the lifestyle of the worker, and worker’s family. The Cape Sable Explorer program promotes reflection on how things have changed with advances in technology, and fishing’s role in our local economy. Learning is self-directed and relies upon object based learning. This program will start with the students gathering in the Banks Fishery gallery. Everyone will get the ground rules and the layout of the program: first activity is with the entire group – the Number Board Game; then the class will be divided into three groups and go aboard the trawler Cape Sable and each group will have a question sheet and set off to explore and find the answers; the program concludes with a wrap up session. The purpose of this activity is to recap the programs discoveries about what trawler fishing involved. The purpose of this activity is to provide the students the foundation of trawler fishing before beginning their exploration aboard the museums retired fishing trawler. 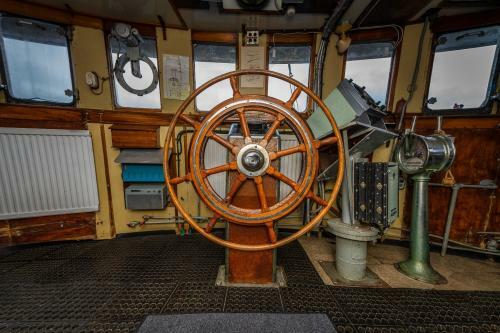 The purpose of this activity is through self-discovery object-based learning the students identify how the living quarters of this 50-year old trawler differ from their living quarters and what specifically has changed. The purpose of this activity is for the student to explore the Skippers zone and get a sense of the responsibility of being in the wheelhouse. The purpose of this activity is for the students to discover the realities of working on the deck of a trawler and to think about the nature of the workload. The purpose of this activity is for the students to share their discoveries and to ignite conversation about how things have changed today.